tree of the family Hamamélidaceae (Witch hazels, Liquidambar, Parrotia, Parrotiopsis). Etymology: Spanish word, from Latin "Liquidus", liquid, and of Arab "Ambar", amber, by allusion to the odorous gum exuded. Origin: North America, discovered in Florida by the Spanish in 1528, introduced to Europe in 1681. Habitat : sunny, not calcareous. Height: 30 m (unusually 45 m in America). 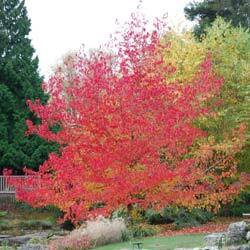 Varieties: there is a Sweetgum of China and an East (Turkey) Sweetgum described in 1610. Dark grey cracked bark. Stems provided with thick ribs. Deciduous leaves alternate (# maples: opposite leaves), with 5 - 9 deep lobes. In autumn, they turn to a nice crimson color. Flowers : the male flowers are the most visible (glomerules fixed on an axis), in April. Fruits : in bowls (formed by capsules welded at the base). They resemble those of the Plane tree. Uses: in the East, a beauty milk was extracted from its balsam, for the ladies, in the XIXth century . The balm contains an essence, Styrax, perfume fixative with a taste of cinnamon. It was used to make the first chewing gum.